Reason #1: They let their fingers do all the creating, not their mind. Their creative process is limited to combining guitar licks they know. Reason #2: Their musical skills are not properly integrated. Having lots of knowledge and skills is useless if you aren’t able to creatively use them to make music. When you overcome the above limitations, playing awesome guitar solos will be easy. Truly expressive guitar solos start by feeling and identifying the emotion you want to make your listeners feel. This clarity is the foundation for everything below. Without it, you can only play licks and scales over chords and hope to create something expressive. Fact: there exists a specific sound for every emotion you feel. After you have determined what emotions you want to express, your ears must identify the sound that matches that emotion. For example, the emotion of intense passion is created by emphasizing the 3rd of a minor triad. The feeling of melancholy is best expressed by emphasizing the 7th of a minor 7th chord. After your ears identify the right sound, your knowledge of music theory tells you what notes to play on your guitar to create this sound. Contrary to popular belief, music theory is NOT “a set of rules” about how music works (or how music should be written). To master lead guitar playing, you must understand the role of music theory and use it to help your creativity. Most guitarists start at this step (of playing the notes) without doing any of the previous steps. When you let your fingers run on autopilot without going through the process of making expressive musical choices, your guitar solos will sound robotic and lifeless. 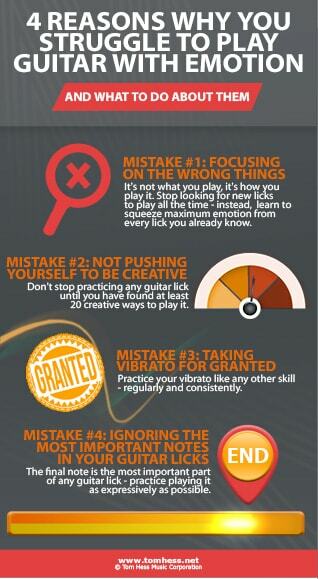 That said, your guitar technique is one of the keys to easily playing the notes you hear in your head. The better your guitar technique is, the more accurate, consistent and reliable you will be at expressing yourself perfectly in your lead guitar playing. After you found the right notes on guitar, you must play them with the most expressive guitar phrasing possible. Pay attention to how the notes are played to squeeze maximum emotion from each phrase you play. 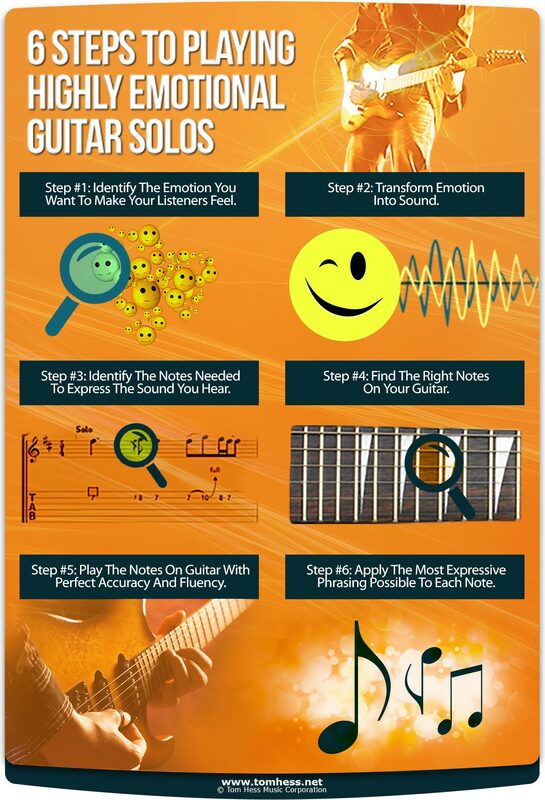 To see and hear lots of examples of how to do this, download this free eBook about playing emotional guitar licks and solos. Master guitar players are able to execute the 6 steps above in a tiny fraction of a second (for each phrase in their guitar solo). For them, the delay between choosing the emotion to express and executing it on guitar is virtually non-existent. This process is then repeated over and over to create (or improvise) the rest of their guitar solo. Most other guitar players either skip some of the steps in the above process or struggle to go through them quickly enough to accurately express themselves. These problems are caused by lack of integration of their skills (and/or lack of mastery of some skills in isolation). To become a truly great improviser, you must master all 6 steps of the creative process to as high of a level as possible. If one element is lagging, you will struggle to express yourself fully. The fastest way to reach this goal is to work with a great guitar teacher who has helped hundreds of people to become killer guitarists. This will help you save years (or decades) of frustration and master the guitar a lot faster. To get a lot more ideas for how to add fire and emotion to your lead guitar playing, download this free eBook about playing emotional guitar solos and licks. Learn how to become a great guitar player by studying the best online electric guitar lessons.